Rarely should he snarl exhibiting his rack of deadly instruments, stacked with 30 teeth that can dig into the senile neck of the running prey and ensure death to one and meal to another. A deer spends majority of his life just escaping the Tiger. 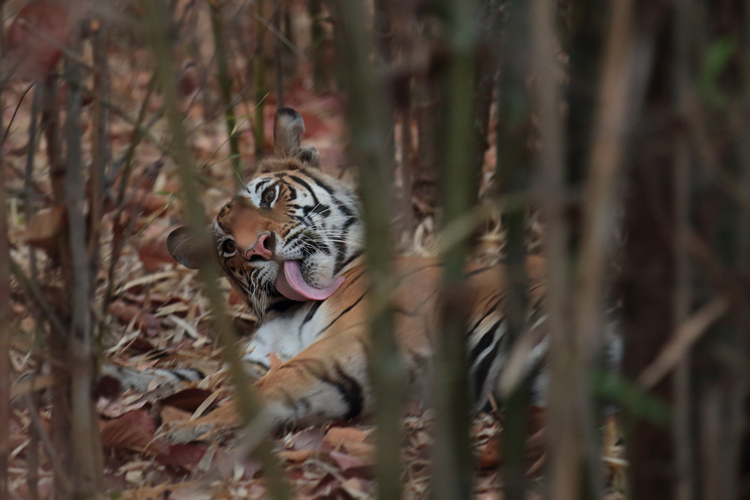 During one such safari in Bandhavgarh National Park, our naturalist managed to get this seldom shot of a tiger’s jaw. 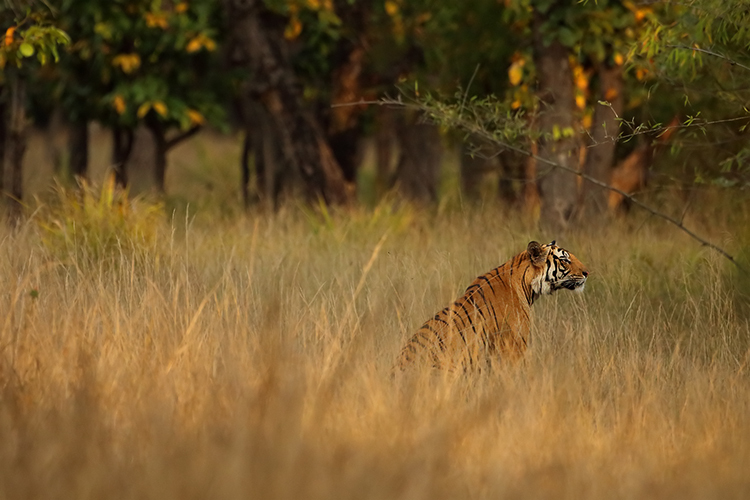 The countdown must start once the prospective prey is determined and the Tiger slyly pushes his body cutting through the grasses, his stripes mixed in the standing spines of grass. The retracted claws would open and take a leap that would decide the unforbidden future of the prey. The jaw muscles of tiger are attached on the saggital crest, top of skull which gives extra strength, grasp and firmness to action. Being crafted to cut and not chew, only up-down scissor movements are permitted to the jaws. The Canines(6-10cms): Two ‘fangs’ on each side of upper and lower jaw, canines are disjointed from incisors to give the hunter a better grip and space to dig deeper down the flesh. The canines are attached to the muscles that reach forehead, exerting a pressure similar to a hammer on nail. The multiple nerve endings help the Tiger to sense the condition of the engulfed prey. The Incisors: The 6 pincer shaped incisors, are much smaller than canines. The role of incisors is to grip the prey and tear off meat from the bones. The precision of incisors is also in skinning feather of a bird and ripping quills of a porcupine. The incisors push the chunks to molars for further cutting. The Molars: The chunks are divided into swallow able pieces using the molars. The low rise molars with ivory sharp edges are placed one on each side of lower and upper jaw. 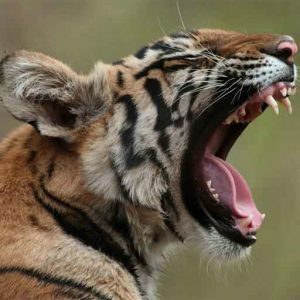 The tigers do not perfect in chewing the prey, their jaw is developed to slice and gulp. The taste buds of a tiger are not adequate enough to distinguish between the fine tastes of meat. The Tongue: If the tiger is hungry, it will even lick off the bones of his hard earned kill. The tongue has conical papillae coated with pointed sheaths which brush off the last remnants of edible flesh. The cubs are born toothless, but just like humans they grow milk teeth in the first few days of birth and shed them after six-eight months. The milk teeth will only fall once the permanent tools have developed enough to replace them. 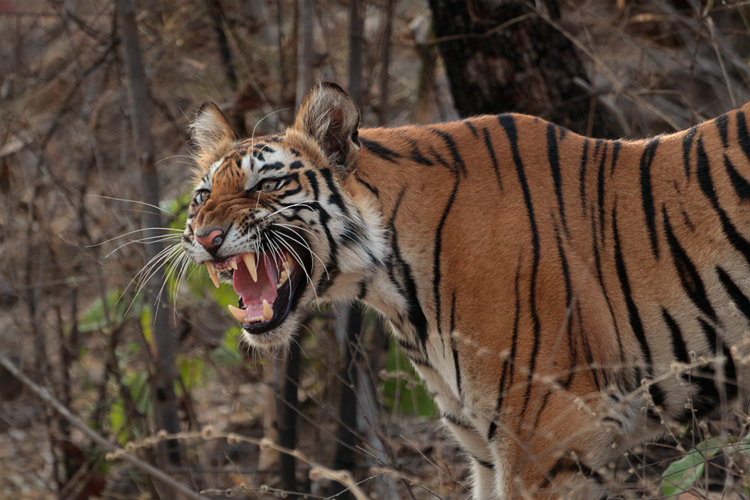 The growth of teeth also hints upon the age and diet of the Tiger. Posted on July 24, 2015 by pugdundee blog. This entry was posted in Animals, Wildlife and tagged Bandhavgarh national parks, pugdundee safaris, tigers of central india, wildife safari in india. Bookmark the permalink.